Simble Solutions Limited (ASX:SIS), an Australian software company focused on energy management and mobility SaaS solutions, has released its consolidated quarterly cash flow report and business update for the quarter ended 30 June 2018. During the quarter, SIS has been accelerating its growth as far as site installations for the Simble Energy Platform. The company attracted its first largescale partners — Optus, Powercor UK, and Synnex — thus delivering a key prospectus objective and laying a strong foundation for 2H CY2018 growth. In the UK, the company secured a technology bundling arrangement alongside one of the world’s largest lighting manufacturers as part of a channel partnership with Powercor Ltd. This arrangement represents Simble’s first success in the UK market, which is witnessing legislative driven demand for energy management solutions due to the UK Government’s smart meter rollout. The Powercor partnership validates Simble’s value proposition and the team’s ability to deliver key business objectives. SIS’s UK expansion is to be further accelerated via technology collaboration with Accel-KKR-backed Utiligroup. Subsequent to quarter’s end, the company received its first material orders for the Simble Energy Platform from recently announced largescale partners in Australia and the UK. Initial orders represent a cumulative value of A$660,000. The sales pipeline continues to grow as existing partnerships mature and new partners are introduced. SIS’s partnership discussions with UK utilities industry participants targeting the broader UK SME sector are well advanced. While there is no guarantee these discussions will evolve into definitive agreements, SIS will keep the market updated if and when this does occur. According to the company, in the nascent stages of these partnerships, demand for the Simble Energy Platform has been strong. Installations are now complete for a selection of new blue-chip users including, Ferrero Rocher, Roehampton University, Richmond Borough Council and Caltex. Year to date, installations of the platform have increased more than 70% even before commencement of major marketing campaigns. Growth is expected to accelerate as new large-scale partnerships ‘ramp up’. It should be noted SIS remains a speculative stock, so investors should seek professional financial advice if considering this stock for their portfolio. The company has entered into a technology collaboration with Utiligroup, a UK-based supplier of enterprise Software as a Service (SaaS) to utilities. Owned by Accel-KKR, Utiligroup has over 30 energy suppliers using its customer, operational and financial management solutions. For over 15 years, Accel-KKR has been investing in mid-market software and technology enabled services firms with $4 billion in committed capital across its buyout and growth capital funds. Utiligroup’s collaboration with SIS is designed to support the next generation of energy management solutions made possible by the UK Government’s smart meter rollout. It is accelerating an upgrade of the Simble Energy Platform that will introduce the ‘Virtual Analytics’ module outlined in the company’s technology roadmap. A formal launch of the Simble Energy Platform’s Virtual Analytics module is anticipated Q3 CY2018. 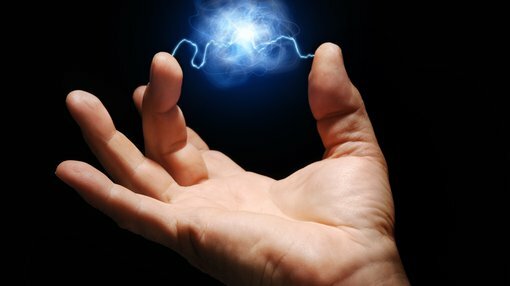 Initial marketing will target utilities in the UK, and discussions with potential foundation customers are advanced. The quarter represented a period of accelerated investment for SIS, with the company principally focused on building its channel partnership network to support commercialisation of the Simble Energy Platform. Resulting partnerships announced over recent months are expected to deliver first material cash receipts associated with the Simble Energy Platform during the September quarter, and are hence not reflected in this quarter’s cashflow report. During the June quarter, customer receipts totalled A$0.48 million, which was principally driven by SIS’s existing mobility software business. Simble anticipates an improvement in customer receipts during the September quarter, driven by both its mobility software business and the Simble Energy Platform. 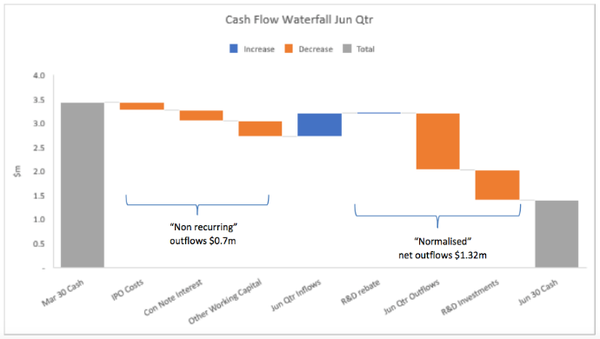 Gross outflows during the June quarter totalled A$2.50 million, a 38% reduction compared with the March quarter which was impacted by significant “non-recurring” balance sheet and transaction costs associated with the company’s IPO, as well as convertible note interest, and other working capital items relating to prior year operations totalling $0.70 million. These are now resolved and SIS expects to deliver a material improvement in cash flow next quarter; SIS states that “on a normalised basis, net outflows were $1.32 million during the June quarter”. End of quarter cash reserves were A$1.4 million. During the September quarter, cash inflows expected from the Simble Energy Platform, the Mobility business, and R&D rebates, have SIS on track to be cashflow neutral. Gross outgoings are forecast to decline more than 25%; the forecast outflow of $1.77 million represents approximately $1.55 million in fixed corporate overhead, and $0.22 million in variable product manufacturing related costs. As of today, SIS has been placed in trading halt at the request of the company, pending the release of an announcement, and will remain so until the earlier of the commencement of normal trading on Friday, 3 August 2018 or when the announcement is released. The stated reason is to assist SIS in its disclosure obligations as it expects to make a material announcement to the market in relation to a proposed capital raising.